As I am typing this the LA Kings have just won their first Stanley Cup in the franchise's 45-year history. Although I'm not a hockey fan, I've held a passing interest ever since I played intramural street hockey in college; plus I am a big fan of just about anything California (especially southern), so it was fun to watch history tonight. This past Saturday I checked another spot off my list and headed out to the southwest corner of the Soda Mountains Wilderness Study Area. 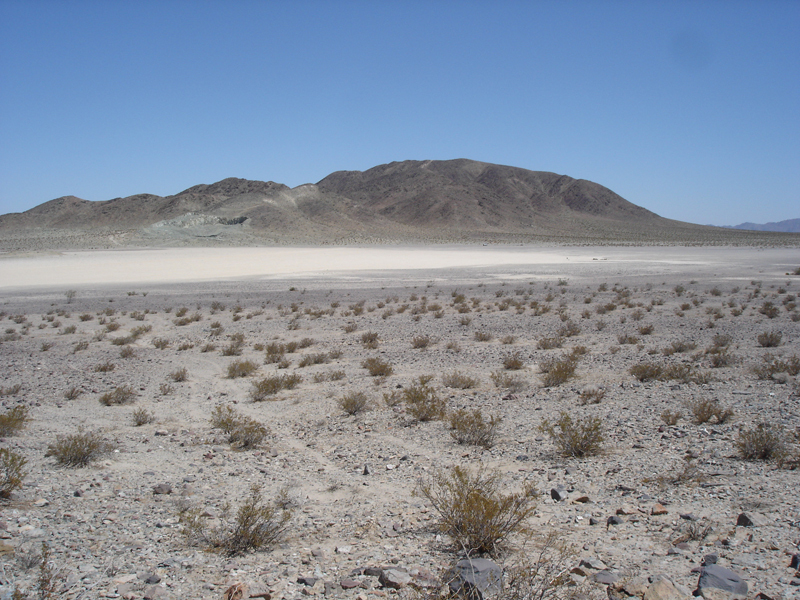 My first stop was a small playa with a mining operation on the north end. When I got there it was only 86*, even cooler than last weekend! 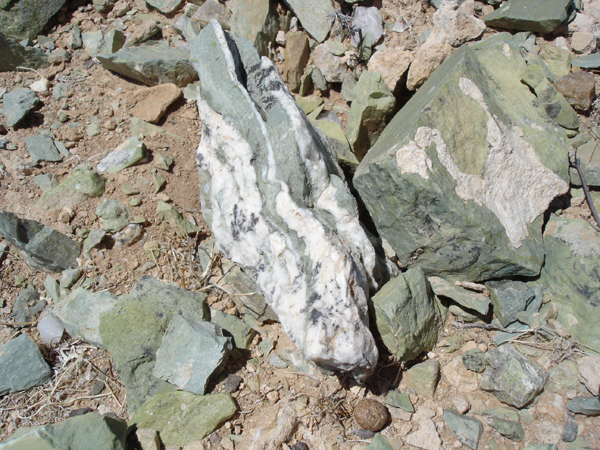 The picture above does not represent the color properly, but that whole hillside was this green rock. Serpentine maybe? The green rocks made their way well out onto the playa. 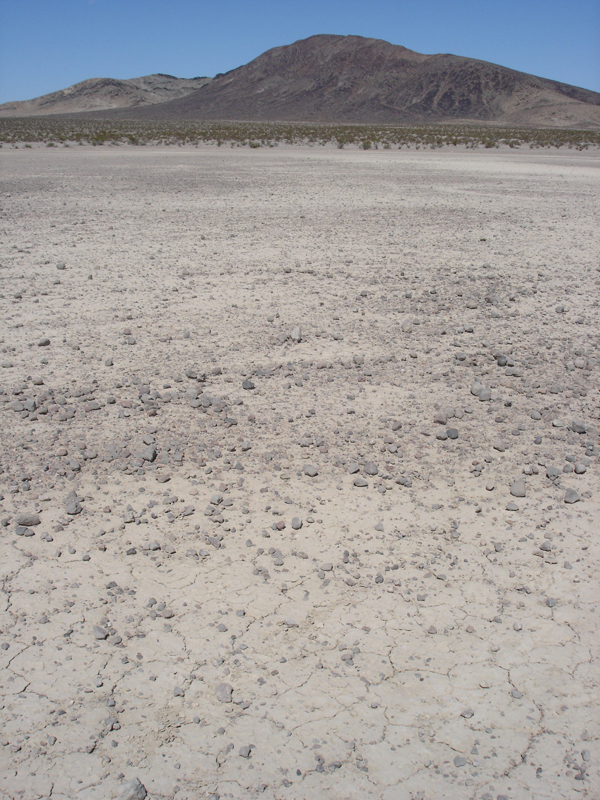 I spent most of the morning checking the playa, but didn't find anything. 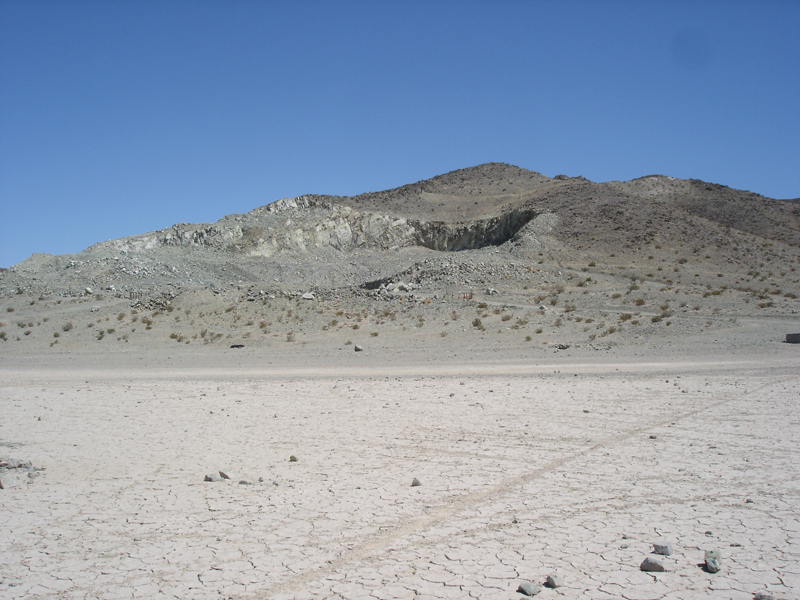 Dark, volcanic rocks migrated their way onto the northwest corner of the playa from a dark, volcanic mountain. 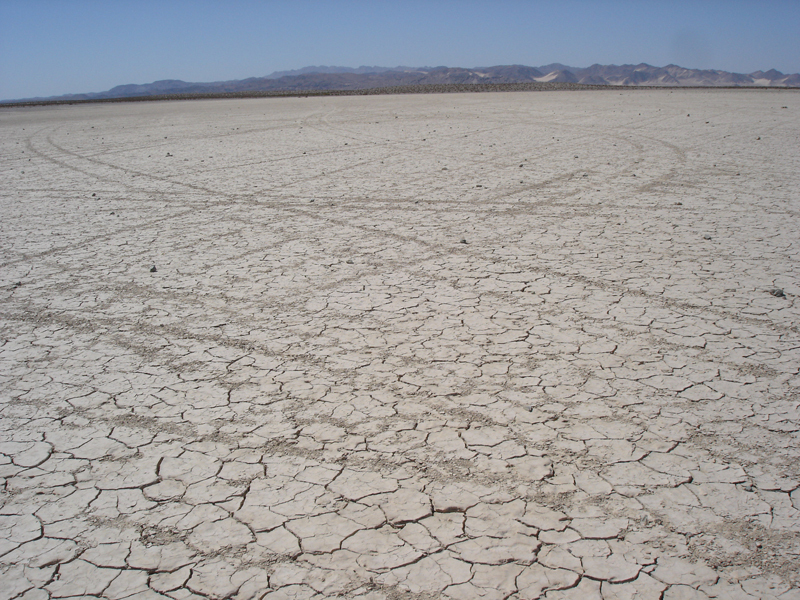 A fine dusting of silt covered everything on the playa. 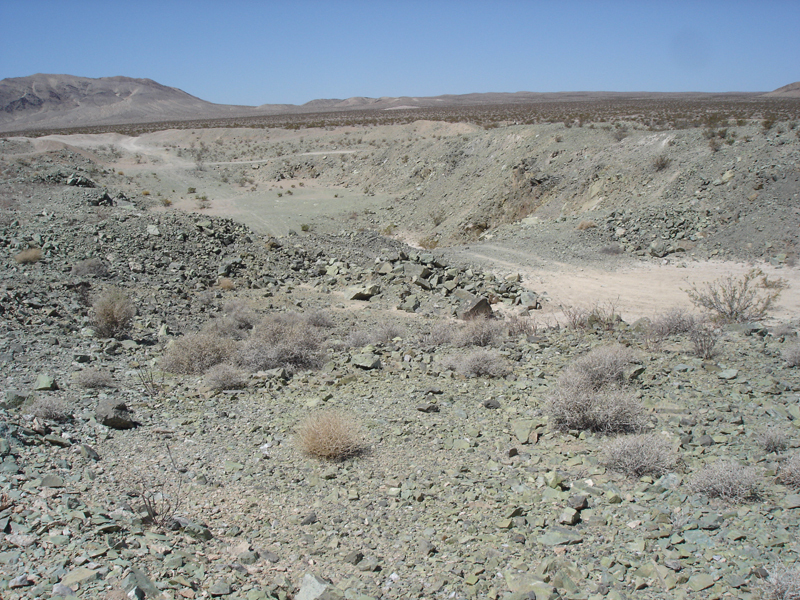 Along one edge in the middle of the playa another mining pit had been dug in the past, exposing a seam of the same green mineral being mined from the hillside. This site did not appear to be active any longer. It had sat long enough for a layer of clay and silt to form at its bottom. A view from the south, looking north. My truck is just visible at the base of the mountain right of center of the photo. 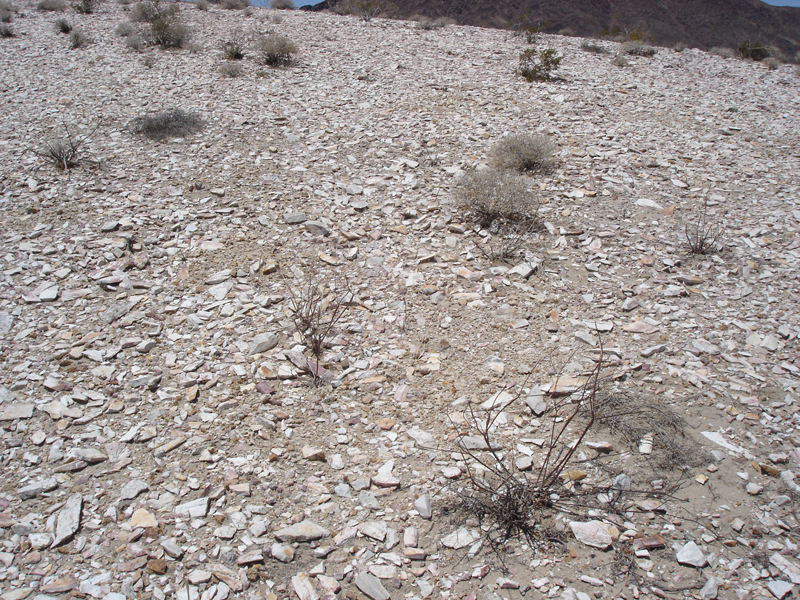 This perspective illustrates the deposition of gravel along the east shore of the playa from the surrounding alluvial fans. As I was leaving this first spot I heard gun shots coming from the north, the direction I was headed. 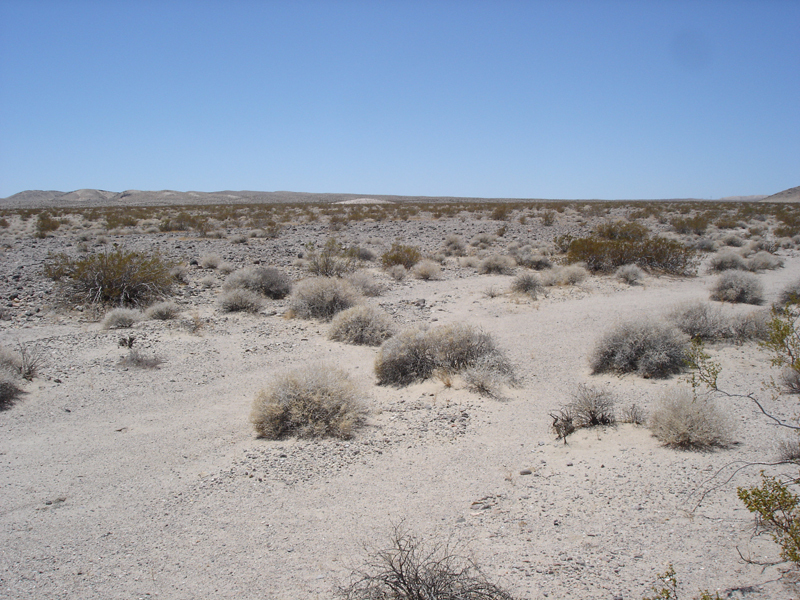 It's not uncommon to come across recreational shooters in the Mojave, and I always make sure I speak with them to see what direction they're shooting, and tell them what direction I'm going to be hiking. Nothing like getting shot in the desert for that authentic Wild, Wild West experience! The shooters were pointed east into a hillside at the bottom of a north-south running valley I had scoped out on Google Earth. There was a series of three low spots along the valley floor; I was able to explore two of them, but didn't feel comfortable checking out the one furthest to the south due to the target shooting even though they were pointed away from me and two hills over. This area was much more lush than anywhere else out there; it was the only spot the brush grew above my head. Jack rabbits hopped out from almost every bush, and the number of bird droppings on the ground led me to believe this was quite the wildlife hang out. Unfortunately it was not a meteorite hang out. I dubbed the place Jack Rabbit Valley. 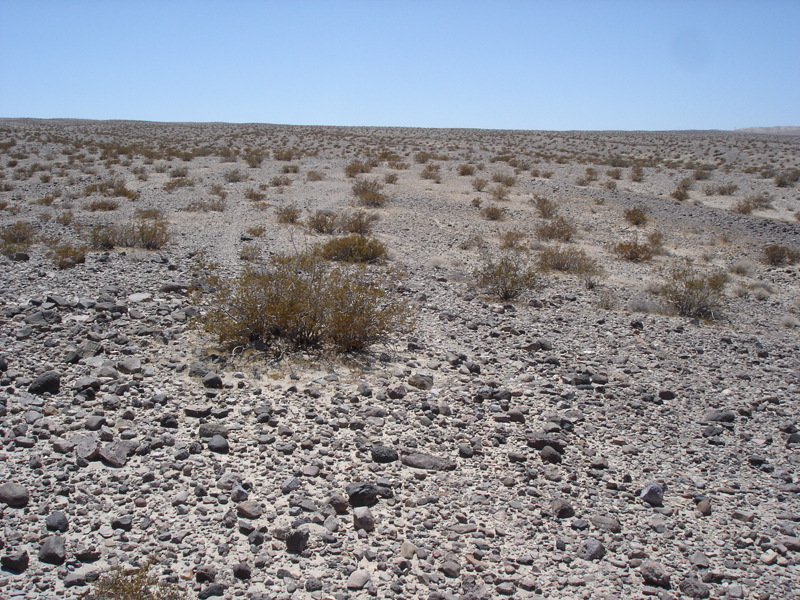 After lunch I unpacked my metal detector to finish out the day in some ridges a few miles to the west of the general area I had been hunting in. 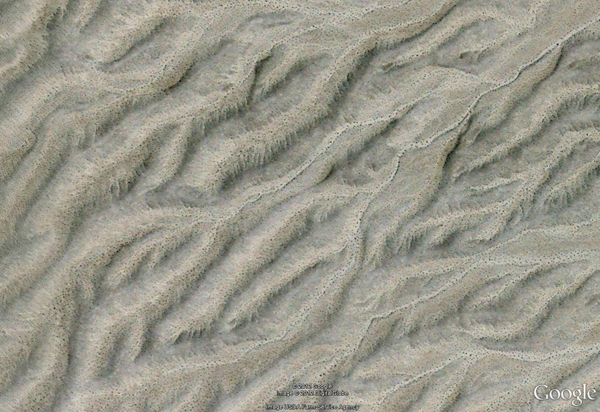 The satellite view of where I wanted to go reminded me of pictures I'd seen of the the surface of Mars taken by NASA's Mars Reconnaissance Orbiter. I was hoping to find some good ground to swing my GB2 over, and these old ridges looked promising. I parked my truck and spotted a white surface feature I was able to locate in Google Earth. 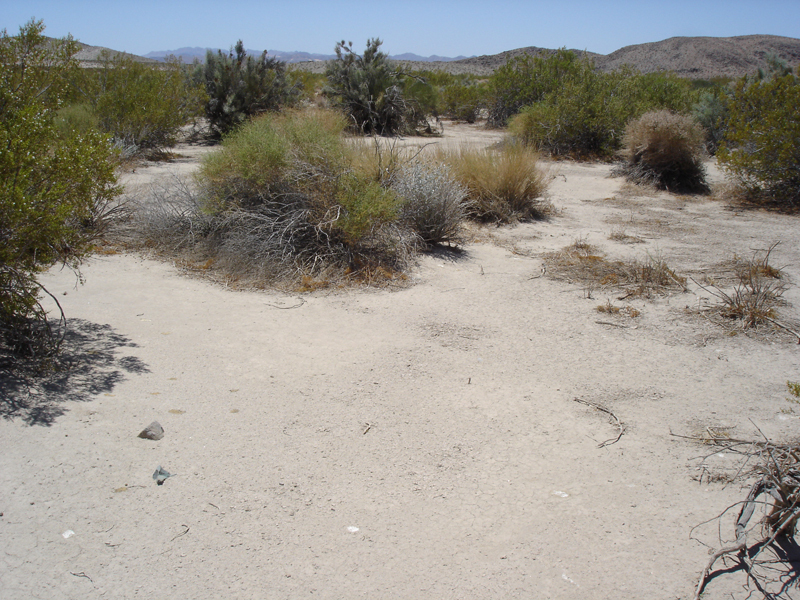 A short 1-mile hike over alluvial deposits lay between the land mark and where I parked. The hills I wanted to detect in began there and extended back another several miles. Here's the land mark hill up close and personal. More terrain like this would be great, meteorites would really stand out against such a light background. 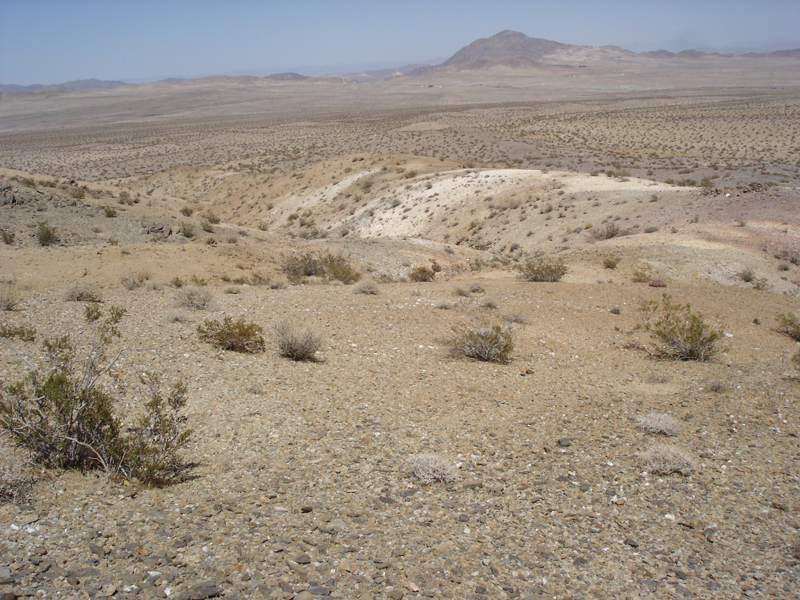 Once I got off the alluvium I was greeted by endless ridges of desert pavement. The GB2 balanced around 8 and only needed very fine adjustment for the rest of the afternoon, this was great terrain for the metal detector. There were a few hot rocks, but they were almost always right on the surface and made a very distinct whine. I found a great looking piece of magnetite almost the size of my fist, and another smaller piece that sticks to my magnet almost as well as a piece of iron. No meteorites this time, but many miles of potential are out there. I made it in about 3 miles before I picked a ridge that would start me back down to my truck. This one in particular was a rainbow of desert hues, from red to yellow, to white and purple and green. Good thing there are none of those pesky plants like they have in northern California to spoil the scenery. It never got much above 95* all day, hopefully the weather will permit a few more of these day trips before we get deep into summer!